Since I was still working part time due to my heath, Tom Miller and Al Pease were the driving force for our first sales conference. From Al’s perspective the main reason for the conference was to introduce our totally reengineered eight bit line of host adapter products using the new TMC-950 chip. This was an important achievement in that it simplified and cost reduced the entire product line while keeping up with new technology such as SCSI-2. Tom was now VP of Sales so he wanted to cement his position as the go-to guy in sales. Tom had grown the sales force by adding Terry Green as VP of International Sales, and replacing Mike with Madonna Saxton. Terry hired Mark Zadeh as International Sales Manager. The conference was well attended with participants from 13 countries. The marketing department produced marketing materials. I gave a keynote and mingled with distributors and customers from around the world. While the sales conference was well received, I constantly hear one criticism, where was our sixteen bit product? By now the IBM AT was almost five years old. 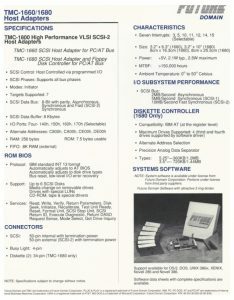 In fact IBM no longer produced the IBM AT, but they did have a successor the IBM PS/2 Model 30 that used the AT bus. However an entire industry of PC compatibles had grown up including PC’s from Dell, HP, Tandy, DEC, and startups like AST, ALR, and Compaq. All these computers used the IBM PC AT bus. Our eight bit cards would plug into these machines and they worked very well, but they were not sixteen bits. 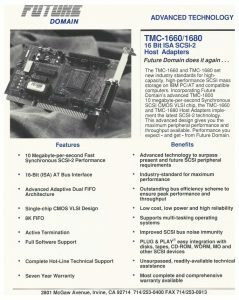 Finally, many of these customers had been recently approached by Adaptec about their new AHA-1520 sixteen bit host adapter. I essentially spent the entire conference apologizing for not having the sixteen bit product line ready, but I promised we would begin delivering in 1990. Some of our customers accepted this, but many said they could not wait any longer and would be changing SCSI host adapter vendors. Our eight bit product line was clearly superior to anything on the market and was as good as or better than most sixteen bit adapters offered by our competitors especially because of our “Disk Maestro” software. Because of that we were still able to sell millions of dollars of those products for the next few years. But the handwriting was on the wall. The market demanded sixteen bit products, this was the era of specmanship and sixteen bit was a required checkbox. The bright spot was Disk Maestro software, which continued to outpace anything else on the market. When 32 bit processors like the Intel 386 came to market new 32 bit IO operations were supported that made IO faster so we wrote special enhanced drivers to support that. 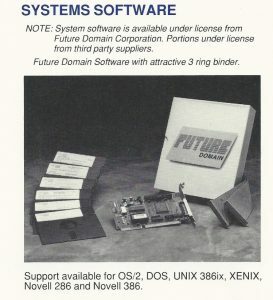 By 1990 we had added software to support CD-ROM and optical drives, along with scanners and printers. After the capital infusion from Summit Partners in February 1989 I had increased Al’s engineering budget significantly. I asked him to expedite the schedule of the TMC-1800. He promised me he would get the product out, but the schedule continued to slip. By the sales conference we still did not have working prototypes of the sixteen bit product. Al would not deliver the sixteen bit product until a year later. The sixteen bit product line was announced in September of 1990. From the sales conference in July 1989 until the end of 1990 we saw our sales plateau. 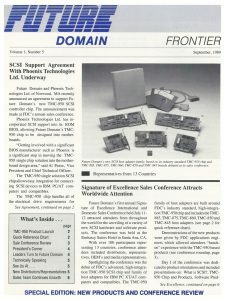 Our customers lost faith in our ability to deliver the sixteen bit product and when the product was finally delivered it cost more than customers were willing to pay for a non-Bus Master SCSI host adapter. In addition we did not have a single customer waiting for the product. Al and Tom had not cooperated in getting prototypes of the design to any customer. Basically Tom did not want to work with Al, and Al did not want to work with potential customers.